Sometimes you can’t get to the gym. It might be because of bad weather, bad traffic, or maybe you just aren’t feeling the travel there and back. Instead of skipping your workout for the day, here are some bodyweight exercises that you can easily do in the lounge or bedroom. This way, you can fit in the daily exercise you need—without the need for any extra gym equipment! Before we lay out all the great ways to workout at home, we have put together a workout for those days where you can’t make it to the gym. It’ll load right into the app if you’ve signed up already! Lunges can easily be done using just your bodyweight. Stand with your knees slightly bent, legs hip-width apart. Then take one leg in front of you into a split position and squat down until the front leg is parallel to the floor. Bring your leg back to its original position and change sides. Instead of stepping back from your lunge back into your starting position, remain in the split position and lunge from there. Then after you have completed your set, revert back to the start and swap legs. Walking lunges – Instead of staying in the one spot, move forward with each new lunge, alternating legs. This will really work on your balance as well. Bodyweight squats are a great workout. To do the squat, stand shoulder-width apart and bend at the hips until your knees are parallel to your glutes. Make sure you keep your chest up, then stand up to the original position. Just like lunges, you can also change things up with the squat. Pulse at the bottom instead of standing up with each rep. Hold the squat at the bottom position to really feel the burn. You don’t need a specific gym bench to work on your arm strength. You can use your bed, chair, or bench at home. Sit on the bench with your legs bent in front of you. Push off the bench until you are supporting your weight with your arms. Lower your body to the ground, bending at the elbows. Push yourself back up to starting position. This will give your triceps a good workout. If you want more of a challenge, instead of putting your feet on the floor, grab another bench or chair and place your feet on it so your legs are suspended between the two. Then repeat the same instructions to do the dip. Make sure that whatever you use, such as a chair, that is is stable and can provide good support. We can’t forget core work! The plank is one of the best bodyweight exercises. Get on the floor on all fours, using your forearms as support. Slowly extend your legs until they are straight. Squeeze your core, making sure your hips aren’t too high or low. If your hips are too high, your body will make an upside-V. If it is too low, your hips will be sinking to the floor in the middle. Your body should be in a straight line. Now, hold for 1 minute. If you can’t then go for as long as you can, trying to increase your time with each rep. Try a side plank as well. This is when you turn your body to face one side, for example, leaning on only your left forearm. Lift your hips off the floor, making sure that you body is once again in a straight line. Extend the other arm into the air above you. Repeat on the other side. People tend to neglect their calves but it is good to get some calf exercises in. Stand on a step or block, something to make you elevated. You should be resting on the balls of your feet. If necessary, hold onto something for support such as a wall or chair. Then lift off your heels as far away from the ground as possible. It should be like your standing on your tippy-toes. Bring them back down in your starting position, then repeat. Want a challenge? Try doing single leg standing calf raises, which is balancing on one leg at a time only. Then repeat on the other side. Now that you know some great bodyweight exercises, you don’t have to skip your gym time. Use these workouts and make a circuit depending. You can also change it up depending on different variables. For example, one circuit might be to do 1-minute of each exercise with 30 seconds rest in between. During that 1-minute, do as many reps as you can do, while performing the move with the correct form for 5 rounds. In another circuit, you can also set yourself a goal, e.g. 20 air squats, 15 calf raises on each leg, that you have to meet before moving onto the next exercise. Superset it (no rest between each set) until you have finished one round of the circuit. Then repeat for as many rounds as you want. Bodyweight exercises may use no or minimal gym equipment but they still can give you a killer workout. Try these bodyweight workouts for when you can’t get to the gym, so you can fit in your daily exercise. Need more ideas for bodyweight exercises? Jefit has a ton of them in our exercise library! Combined with a workout log, customizable workout planner, you have everything you need to have a great workout session. 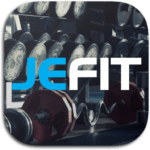 We even offer a members-only Facebook group so you can chat with other Jefit members! Join here today! Not sure if these exercises will get me the body like on the pic, but it’s definitely better than sitting and eating. Need more bodyweight content, not everyone can get to a box gym!